Both have parking for up to 3 cars. Up to 3 well behaved dogs are welcome at both cottages by prior arrangement. 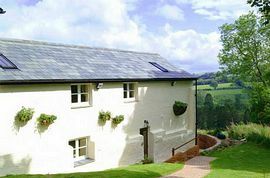 Foxtwitchen is a former barn, now converted to a very high standard to a comfortable holiday cottage. Leys Cottage is a farm house adjoined to Foxtwitchen, that offers comfortable accommodation all year round. It sleeps 6 in 3 double bedrooms, (1 en suite). 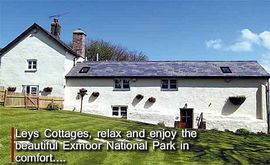 The cottages nestle at the heart of beautiful Exmoor National Park, looking down over woodland coombes and open moorland to Withypool Common. Approached by a shared country track, Leys Farm Cottages are surrounded by the owners’ land, home to their animals and dogs. 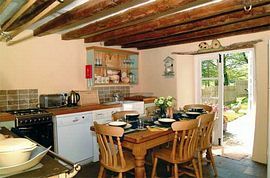 Enter Leys Cottage by the French doors that welcome you into a well equipped kitchen/dining room with oil-fired Aga, 4-ring gas hob, electric oven, combination microwave, fridge freezer, washing machine / dryer and dish washer. Step through into the sitting room with its 3 large comfortable sofas that frame the room and its focus point – the stove which burns both wood and coal. Here you’ll also find Freeview TV, DVD player, CD and cassette tape player. Second bedroom – with 'Zip and Link' bed that gives you the option of twins or queen. This bedroom has a TV and video. 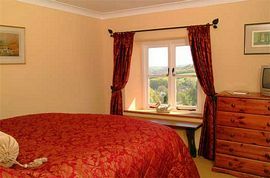 Third double bedroom - with double bed, bedside cabinets. Bathroom This has a bath with shower attachment, toilet, bidet and basin. Foxtwitchen Cottages ia approached via stepping stones across the lawn take you to this semi-detached former barn. Step into the hallway and on into the sitting room with its natural wood floors and inspiring country views. Here you'll also find a TV, DVD, CD and cassette tape player. At the other end of the hallway you'll find your well equipped kitchen/dining room with electric cooker, microwave, fridge, freezer, washing machine/dryer and dishwasher. There's also a separate toilet and basin on the ground floor. 1. Master bedroom – country views, 'zip and link' bed that gives you the option of twins or Queen, en suite shower, toilet and hand basin. 2. Second bedroom – garden views, 'zip and link' bed that gives you the option of twins or Queen, en suite bath, toilet and hand basin. Outside, you have your own large garden and al fresco dining area, complete with barbecue. 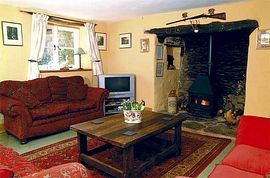 Leys Farm Cottages are a fantastic base for walking, hiking, horse riding and many other country pursuits. There are several excellent eating places within easy reach and rural heritage abounds, with one of the oldest bridges – Tarr Steps – within easy reach as a vigorous walk or short car journey. The River Barle is within walking distance, while Dunster Castle and beach are a short drive away. Up to 3 dogs can be accommodated upon request. £20 per dog per booking. Local Services: Village shop - provisions can be ordered online and delivered to await your arrival. Excellent pub with good food in the village. Shops, bank, garage, restaurants etc in Dulverton.